From the beginning of time, humans have had a desire to leave a record of their existence. Symbols and drawings carved into stone tell the story of leaders, wars, bountiful harvests � in short, the history of civilization. Our company has been involved in a number of projects reflecting this passion. 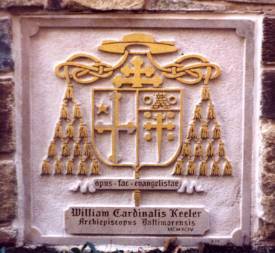 These range from family monuments in private cemeteries to those of a much larger scale including The Third Infantry Division Memorial in Arlington National Cemetery, carving the fa�ade of the Embassy of Singapore in Washington, D.C. and the coat of arms for William Cardinal Keeler at the Basilica of the Assumption in Baltimore, MD. While public memorials may hold a highly visible place in the community, it is often the family monument that holds the important place in our heart. A tangible expression to celebrate a life, a memorial can also serve as a source of genealogy. 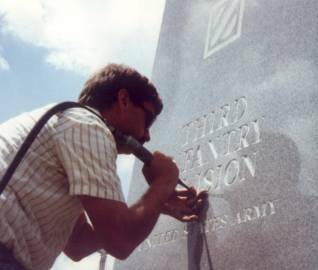 Whether granite, bronze or marble, more than just a name and dates are needed to tell the story of a person�s life. We operate a full service shop in Baltimore, MD as well as having portable equipment to provide on-site applications. 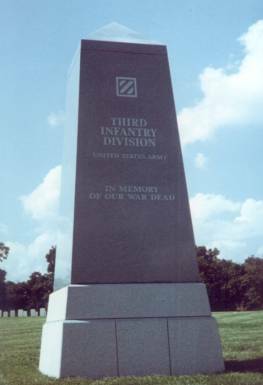 Feel free to contact us for help with public or private memorials, signs, building demarcation, pet markers, golf course signage, even mausoleums. Located in Baltimore�s Inner Harbor area, we are minutes from The National Aquarium, The Maryland Science Center, and Oriole Park. Feel free to stop by or give us a call.